Seventh grade students of science teacher Erika Klose, at Winfield Middle School in West Virginia, tackled lessons from LearnGIS, an online course designed for adults. "We did [the volcano lessons] all on our Chromebooks and were very successful. This provided a great background for our next activities. They had fun!" A 12th grade student in Marcel Duhaime's math modeling class at Bow High School in New Hampshire performed drive time analysis to demonstrate levels of coverage provided by current fire station locations. Students in Matthew Cowan's ninth grade English class at Yucaipa High School, in California, are working on story maps that locate events in John Steinbeck's novels. Teachers find that students love working with maps. Some students are really quiet when they're engaged, while others generate a buzz of excitement as they share what they find or help each other. The magic is engagement, intensity, and duration. "I have found teaching with ArcGIS Online helps me differentiate my lessons and helps all my students learn," said Dave Casey of Buffalo Central Middle School in Minnesota. 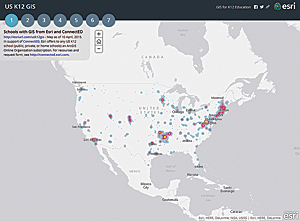 "Students who have struggled in the regular classroom seem to grasp the lesson well using ArcGIS." Because it's web based, students can use ArcGIS Online on computers, laptops, tablets, and smartphones of all shapes and sizes that run a variety of operating systems. Sometimes students all have the same type of device. Other times it's a medley of student- and school-provided devices. Either way, it's usually not a problem. A student can work on ArcGIS Online and move seamlessly from an Android phone to iPad to Chromebook to the teacher's Mac or Windows laptop within a single class period.